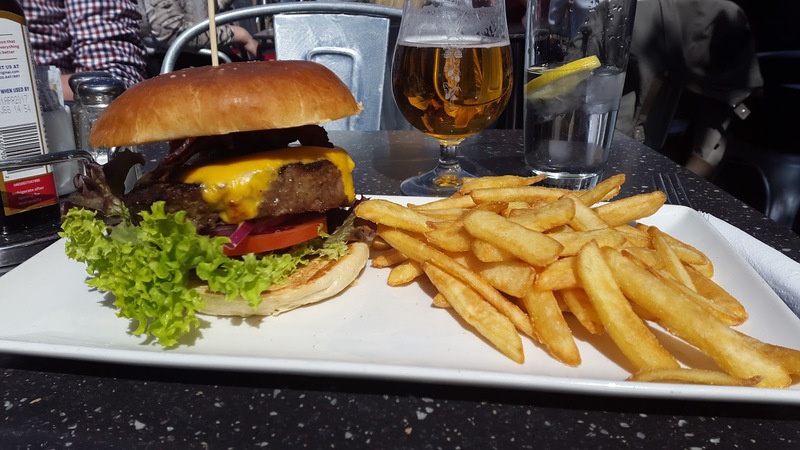 Touted as Oslo’s oldest American Diner, and established in 1989, this was the first visit on my tour of Oslo’s burgers – down in the newly developed docklands area of Norway’s capital. Keen to sample a selection of burgers – along with a local lager – we ordered a Farmer’s De Luxe (bacon cheeseburger), a Tijuana Teaser (topped with chilli con carne), and a Southern Smoker (topped with bacon and a homemade smoked chipotle sauce). 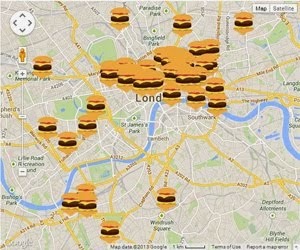 All the burgers are served with fries, and speared with a wooden skewer to hold them together. 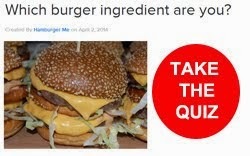 Presented with melted, neon American cheese running down the patty, this burger had the most promise, but a closer look, and subsequent cut-through showed a processed burger patty compacted into a perfect sphere and the dense, lean beef had little in the way of a discernible grain, or juice. On the plus sides, the dry cure bacon was rich and salty – perhaps it could do with a bit more crisp, the American cheese struck the right balance between sticky, gummy texture and a mellow cheddar-like flavour, and the brioche bun was also excellent – not as fluffy or airy as it’s British cousin, but toasted and giving just the right squash to wrap up your burger. The watery tomato added nothing, while the Romaine lettuce and chopped red onion added a good crunch to the burger. 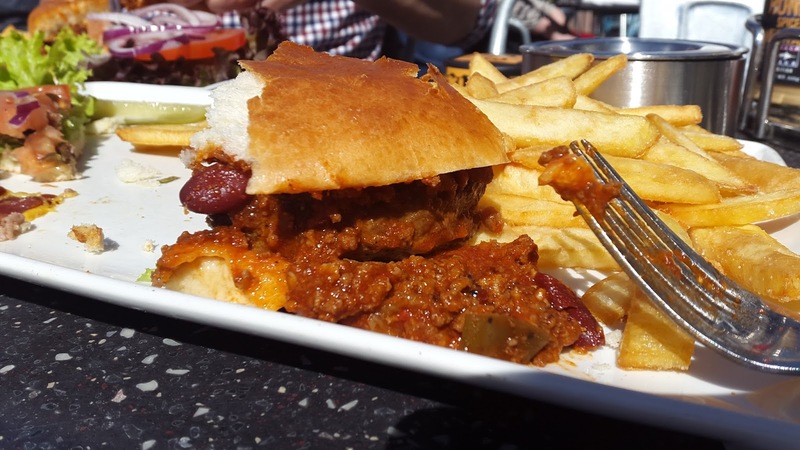 This burger suffered the same beef fate as the Farmer’s, and in spite of the saucy chilli con carne, it lacked the spice needed to pep up the flavour. Salad served on the side was colourful, but left untouched. 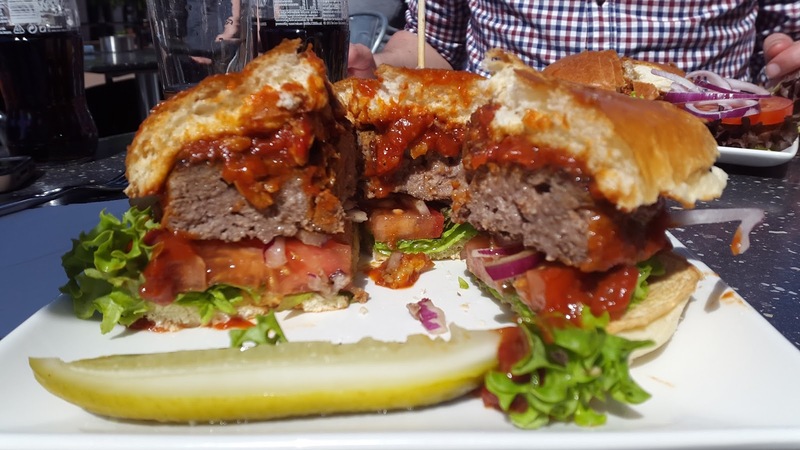 This burger was worse still – a sweet, sickly smoked tomato sauce drowning out the decent dry cured bacon, and not a touch of smoky heat from the chipotle to be found. 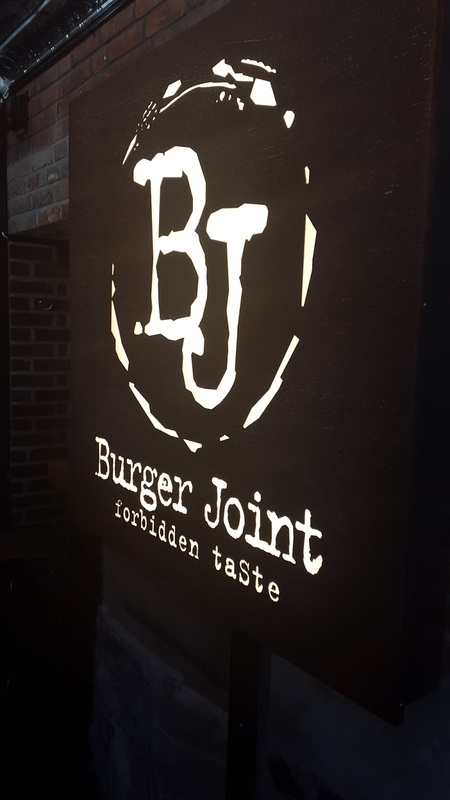 Burger Joint is a hop, skip, and a jump from the Beach Club in the docklands area of Oslo. 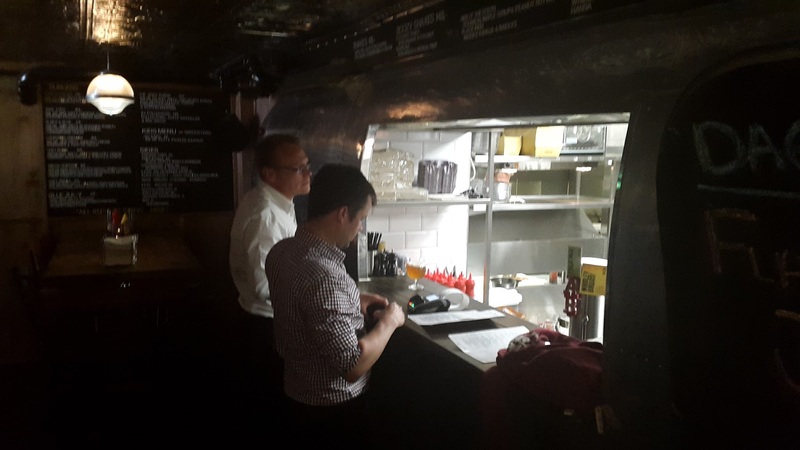 It’s a small basement restaurant which manages to contain the frontage of an entire airstream street food van sticking out from the wall – a hatch for orders, and a window into the kitchen where the magic happens. 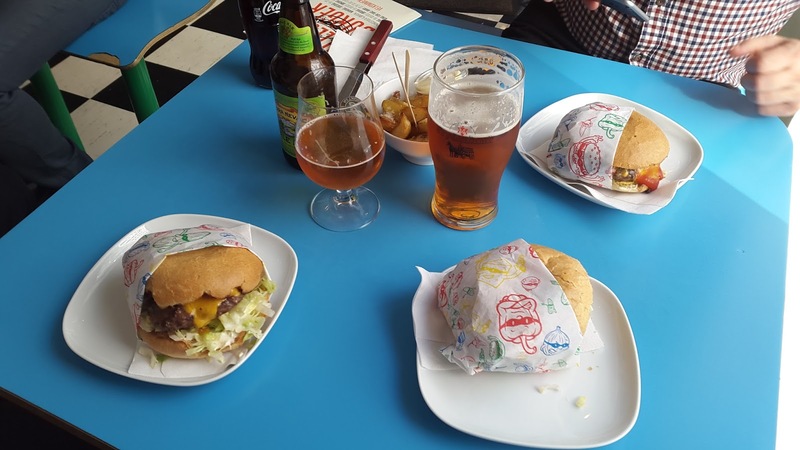 We go for the Classic (with bacon), the Juicy Lucy (as you’d expect), and the Flaming Hot special (jalapeno battered onion ring and chopped green chillies). This is a very decent effort at a bacon cheeseburger. It’s presented wrapped up in a pocket of grease-resistant brown paper, patty and toppings peeking out coquettishly from the wrapper. 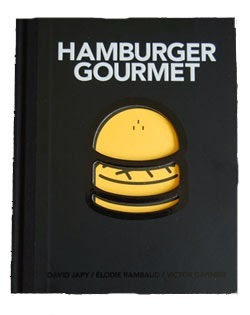 A tongue of streaky bacon and melted cheddar cheese on clear display. 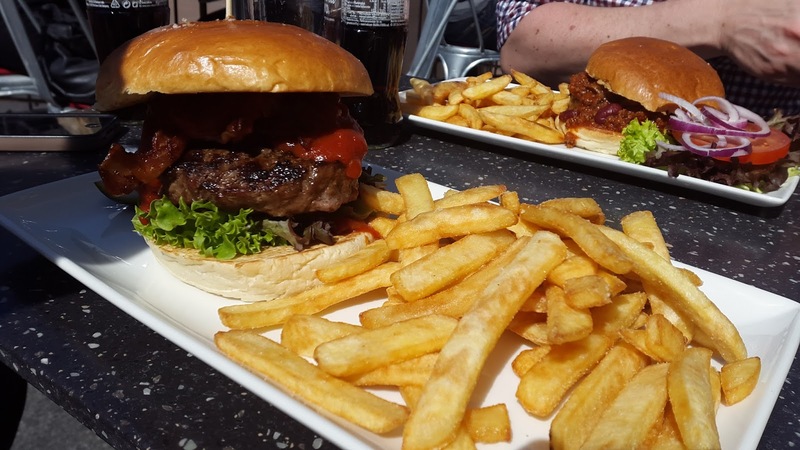 The hand-formed and griddled beef is cooked lovingly medium and the cheddar and bacon combine with braised white onions and pickles to deliver a decent hit of classic hamburger taste. 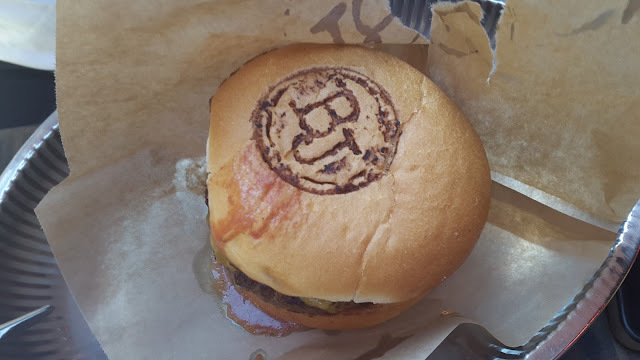 The bun is branded with a Burger Joint “BJ” logo and perfectly toasted, but alas, it is a bit flavourless as a bog-standard processed white bun, but lacking any notable flavour in itself – it is toasted, and has BJ’s logo branded into it – which looks pretty cool. This could have been great, but was lacking in the main department where a Juicy Lucy should shine – the gooey cheese centre. 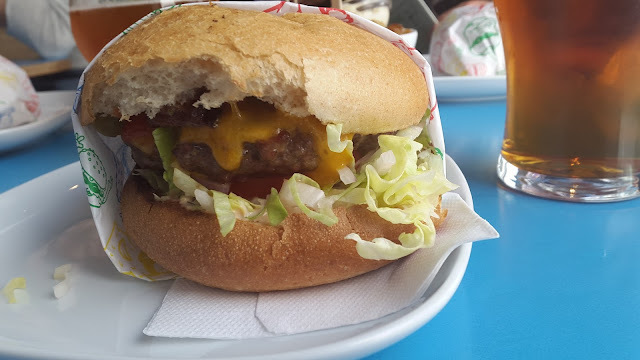 I was expecting it to come out oozing, but instead there was a thin, translucent drip of cheese in its meat cavity. 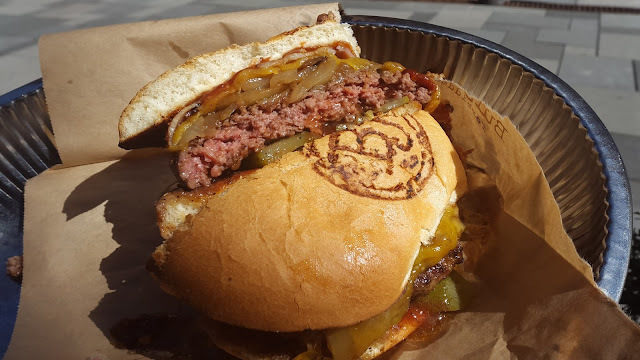 The burger was tasty, particularly coupled with the jalapeno battered onion ring, burger sauce and dill pickles, but the lack of Lucy was a downer. 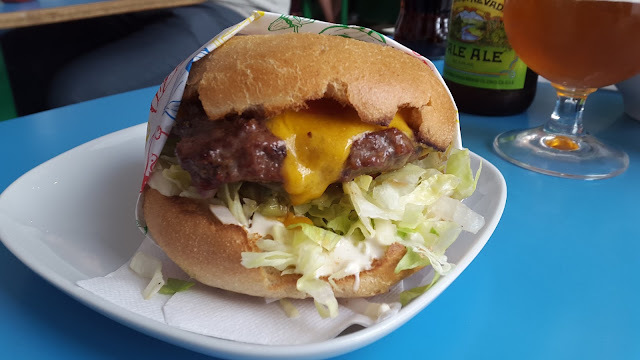 This is a pretty decent burger, like it’s counterparts in the beef and bun departments, but with a chipotle slaw and chopped chillies on top, it also packs a good, spicy punch. It needs a hit of acidity in there so some more red cabbage, or lemon juice in the slaw would work well. 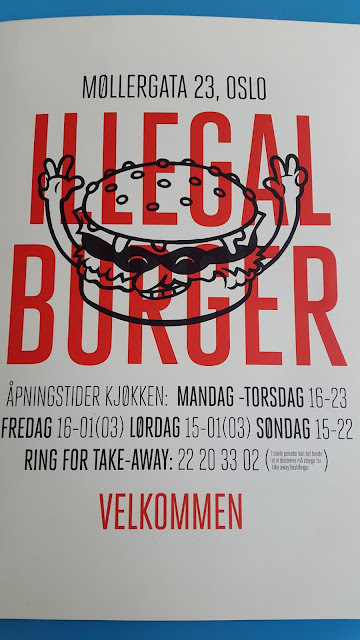 A stalwart of Oslo’s independent burger scene, Illegal Burger is known for its quirky artwork, hipster dining crowd, and pumping music. It’s located in the administrative district, just by the Norwegian socio-democratic party headquarters, and you could walk straight past it with no obvious sign or livery on the building, just a small poster on the door to tell you you’re in the right place. 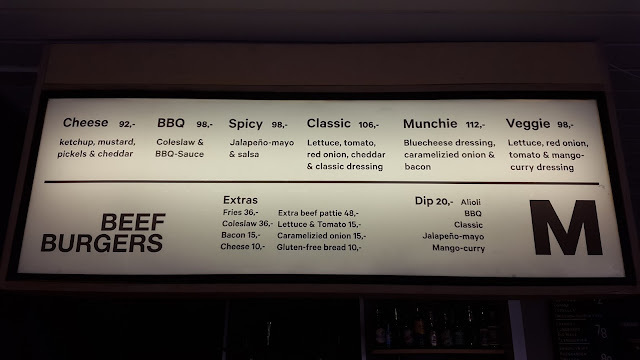 Sticking with our theme for the day, we went for a Cheese Royale (with bacon), the Illegal Spessial (with guacamole), and the spicier Greenchillisalsa burger. 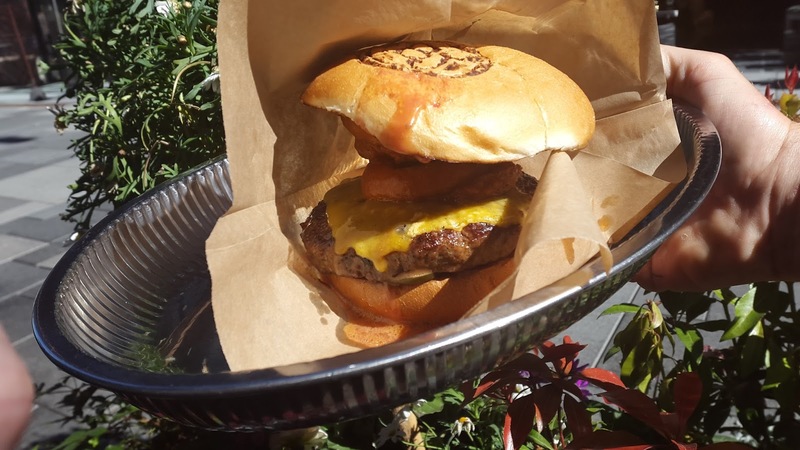 This is the epitome of an honest American cheeseburger – but in a random build order. As standard was the chopped iceburg lettuce slaw and tomato drenched in illegal burger sauce, then the American cheese (this was nicely melted and satisfyingly gummy) topped patty with bacon. 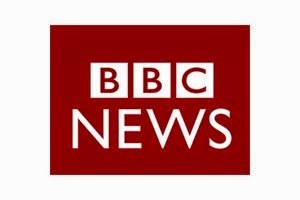 But then came a slightly odder combination – lengthways sliced pickles topped the bacon and cheese, which were stuck to a mustard spread top bun. It tasted good, but structurally was unsound – the beef sliding around on two slick layers. 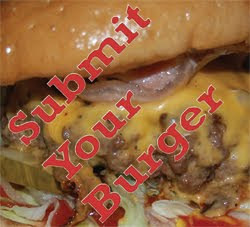 The bun itself was more of a softened crusty roll and worked well across the burgers. 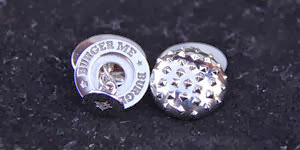 Gluten free available too. The beef was the big let down here. Having advertised as serving their burgers medium-rare, the well-done pucks of sinewy, lean beef were a disappointment. This just tasted of guacamole. Everything else was drowned out by this over-lemony condiment. 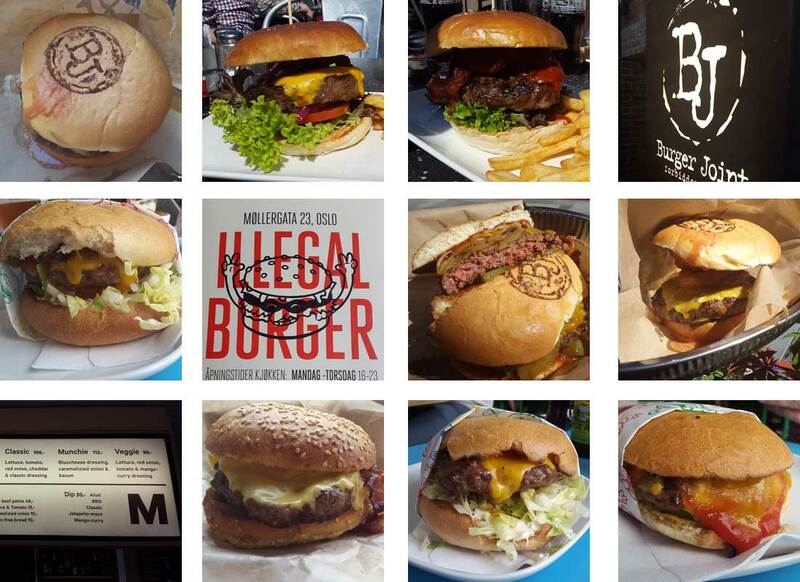 Of the three burgers I tried at Illegal Burger, this was my favourite. 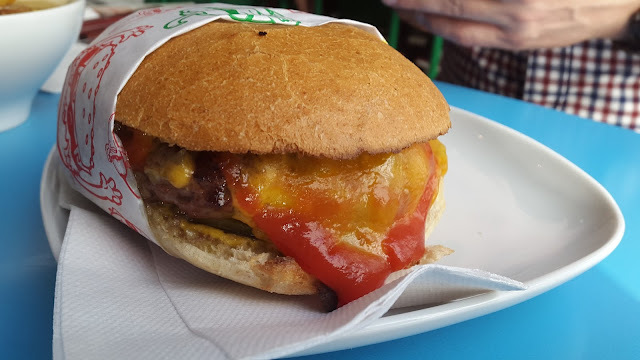 A veritable curtain of melted cheddar smothered with ketchup covers a finely chopped salsa of onion and spicy green chillies. The heat was rounded and fruity, and had a long aftertaste in the mouth. 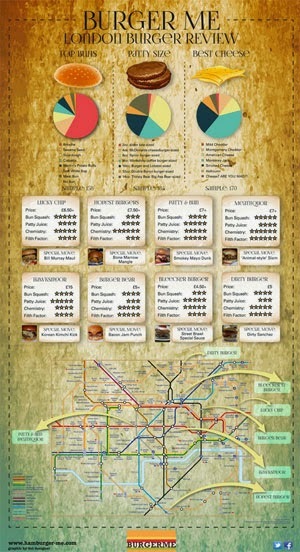 In a city that doesn’t like spicy food, this is a revelation. Ostensibly a street café, it’s only when you get inside that you realist this is a fast(ish) food burger joint with a fantastic selection of craft beers. 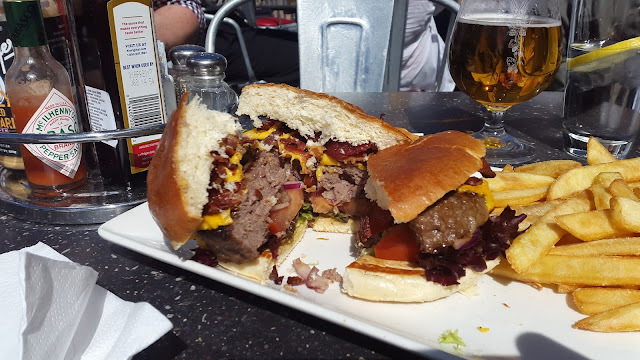 After sampling nine burgers, I decided I could squeeze a tenth in – for reseach purposes – and went for the Cheese (with bacon!). 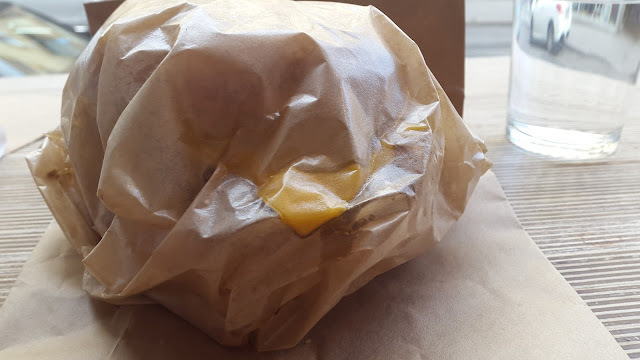 This is the first burger in Oslo that came wrapped in the fast food burger style, and the way the American cheese was visible through the grease-proof paper showed promise. 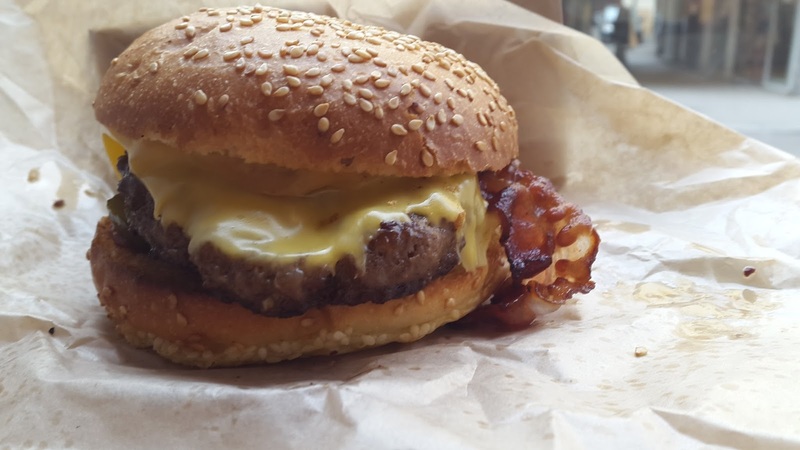 This was even more promising once the burger was unwrapped with the large expanse of melted American cheese covering the surface area of the beef, and with a curl of crispy bacon peeking out from under the bun. 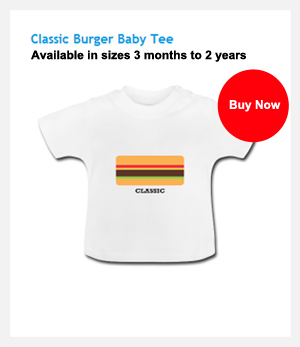 Following the classic American cheeseburger style with ketchup, mustard and pickles would have been great, save for the pickles being far too sweet and without a much needed vineagar-y kick. 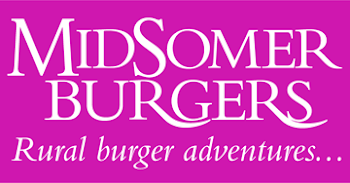 The sesame-seeded bun was nicely toasted and looked great, but it was too dry – possibly having been left out for too long in the kitchen. The beef was dry and cooked medium-well while the cheese which showed such promise was cheap and lacking in flavour. The bacon, on the other hand, was streaky, salty and easy to bite through, adding much needed balance to the burger. 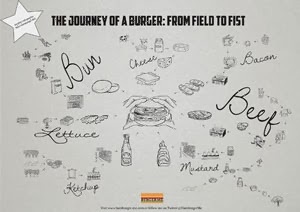 Get the beef cooked right, and give me a fresh bun and this burger has a lot of promise. So there we have my burger adventurers guide to the Oslo burger scene.